If you accept that the future of publishing is being heavily influenced by Internet usage, then it’s important to get a handle on Internet metrics. The numbers can be startling. Let’s start with an easy one, with no surprises. 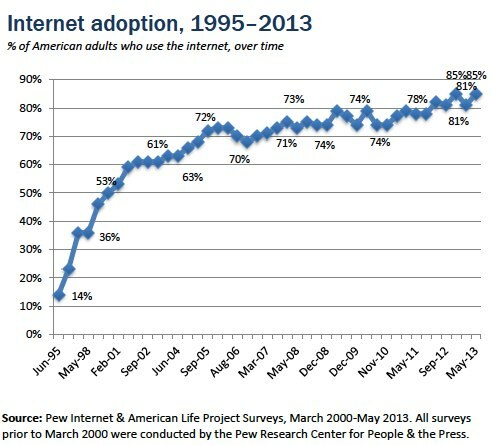 According to the Pew Internet project’s May 2013 survey, 85% of American adults use the internet (contrast this with the report Internet Penetration and Impact, April 2006 which showed 73% of U.S. adults online, up from 66% in January 2005). 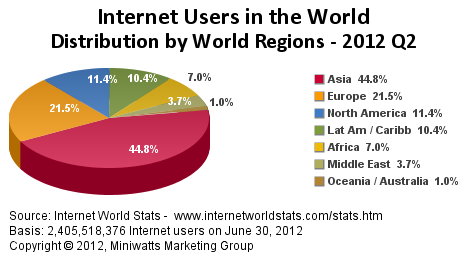 This chart demonstrates that at least in terms of total number of users North America has fallen far behind Asia and Europe. Latin American is close to catching up. There is a lot of moaning and groaning about “the digital divide” — the problem when third world countries (or even the impoverished in our nations) do not have as ready access to new technology as we do. I’m not a subscriber to this sorrow. First of all, the explosion of adoption of cellphone technology over the last 15 years greatly reduced the major problem in the third world for access to telephonic communication. That set a trend for other technologies. Second of all, pioneers like Nicholas Negroponte are directly addressing the challenge of Internet access in the third world (see my “Influences” section on “Literacy”). Third of all, there are far too many corporations, NGOs and national governments that are fixated on this issue to imagine it will not soon be addressed. Fourth of all, a delay of a year or two in gaining Internet access, is, in my view, more a blessing than a curse.